With a long holiday weekend lined up for the 4th of July most people are probably worried about having enough food for the barbeque, or hoping that their get-togethers aren’t too political. Facebook will be littered with messages of freedom, and assorted dissents. I post a link to Frederick Douglass’ 1852 speech "What to the Slave Is the 4th of July?" to mark the occasion most years. For many people this year will be different and it is important that we pay attention. The freedoms marked by the day are under attack. It is important to consider the choice of reflecting these specific values. For example, in Canada they say: "peace, order, and good government," and in France: "liberty, equality, fraternity." “Life, Liberty, and the pursuit of Happiness” have been specifically chosen to represent the United States of America from its inception. These values preceded Democratic and Republican parties: the founders were Federalists and Anti-Federalists. The founders focused on guarding against tyranny, both of the majority and by elected rulers. James Madison wrote, “It is of great importance in a republic, not only to guard the society against the oppression of its rulers, but to guard one part of the society against the injustice of the other part.” These days the rulers are tired of the people getting in the way. It would be easy to highlight the hypocrisy of the role of slavery in the formation of the U.S.A. The hardest thing about being an American is being honest about the ugly details of our history. People in some demographic groups will be worried if they are pulled over while speeding on their way to store to pick up a missing ingredient or some briquettes for the grill. Some people will be working for a minimum wage that isn’t a living wage. Others will be unable to enjoy the holiday because of the recent loss of a loved one who was killed in a hate crime. That sadness is the same regardless of religious belief, sexual orientation, or skin color. We have a President targeting and bullying different groups. Current policies break families apart and put them on hold. We have the National Rifle Association making sure that domestic terrorists never have a problem accessing instruments of death. There may be as many as 22 or 23 million Americans losing health insurance; they might have a reason to protest. “The right of the people peaceably to assemble, and to petition the Government for a redress of grievances” is a liberty guarded in the First Amendment of the Bill of Rights. The March on Washington for Jobs and Freedom — August 28, 1963; an anti-Vietnam War protest in Washington DC — November 15, 1969; the Anti-Nuclear March in New York City’s Central Park — June 12, 1982 were all events where hundreds of thousands of Americans made a statement about policy. There are currently efforts (Republican) to restrict the right to protest in 18 states. This is not what you’d expect from the nation of the Boston Tea Party. The reason we must keep the 4th of July political is because freedom and equality are political. 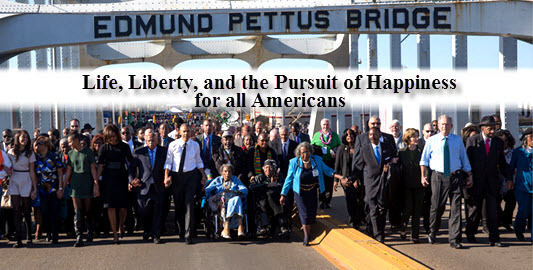 The success of the civil rights movement in the 60’s required actions like marches to Selma. Political discussion and protest are required because the public isn’t getting what it wants. The 4th of July is not a day for ignoring tyranny. This 4th efforts are everywhere and they are undeniable. More fundamentally we have to be political because we need life, liberty, and the pursuit of happiness for all Americans. Wim Laven teaches courses in political science and conflict resolution and is on the Governing Council of the International Peace Research Association. He is syndicated by PeaceVoice.